Option A (Recommended): HP Battery Program Validation Utility will check if the battery in your notebook computer is affected. Validation using the utility generally takes less than 30 seconds. Requires.net 4.5 framework and HP CASL Framework to be installed in order for utility to function. If you do not meet minimum requirement's, please download the fully loaded battery validation utility that will install the required frameworks. Click here (EXE, 1.9 MB)) to download and run a utility that will check if the battery in your notebook computer is affected without your having to remove the battery. (Recommended). Then complete the form below to order a replacement battery if eligible. Requires .net 4.5 framework and HP CASL Framework to be installed in order for utility to function. Most users already have framework installed. If you do not meet minimum requirement's, please download the fully loaded battery validation utility that will install the required frameworks. Alternatively you may validate your battery manually without installing the battery utility, by shutting your notebook down, disconnecting the notebook from external power, and removing the battery from the notebook. You may continue to use your notebook without the battery installed by reconnecting the notebook to external power. ** For instructions on how to remove your battery please click the + sign next to “Battery bar code number” below. Note: These images may not be an exact representation of your notebook computer or battery. For detailed instructions click the + next to each item. Locate the Serial Number of your computer and the bar code number on your battery and enter the information below. (2) Open System Information by pressing fn + esc on the notebook keyboard. The Serial Number displays at the bottom of the window. (i) in Windows 7: Open the Start Menu, then type cmd in the search box. (ii) in Windows 8: From the Start screen or search icon, type cmd to open or begin the search. (iii) in Windows 10: type cmd in the taskbar search box. b. In all Windows Operating Systems, then select Command Prompt from the search results. c. Type wmic bios get SerialNumber, or wmic bios get serialnumber and press Enter. The serial number will display. You may also refer to the video here. WARNING: Before beginning removal of the battery, shut down the notebook computer and disconnect from external power. Step 1: On the bottom of the notebook, slide the battery release latch(es), identified by a battery icon, to release the battery. Step 2: Remove the battery from the notebook. Why is HP expanding the June 2016 Battery Recall? Why is HP expanding the June 2016 Battery Recall? The product list looks the same as before, what is new about this expansion program? The product list looks the same as before, what is new about this expansion program? It has been determined that additional batteries used in the manufacture of the same products are affected by a potential safety issue. I checked my battery and was told it was not affected. Do I need to check it again? I checked my battery and was told it was not affected. Do I need to check it again? Yes. HP has identified additional batteries that have been included for the expansion. It is possible that your battery has now been identified as being part of this recall program. It is essential to recheck your battery, even if you did so previously and were informed that it was not affected. I recently replaced my battery through the recall program. Do I need to check it again? I recently replaced my battery through the recall program. Do I need to check it again? No. If you have already received a replacement battery through the HP battery recall program, you are not affected by this expansion. Why didn’t HP identify all of the affected battery packs before the June 2016 announcement? Why didn’t HP identify all of the affected battery packs before the June 2016 announcement? HP continuously monitors issue reports and reported problems. Our monitoring showed that additional batteries should be included in the recall program. Why do I keep getting announcements, but then I am told my battery is not affected by the recall? Why do I keep getting announcements, but then I am told my battery is not affected by the recall? HP has identified additional batteries that have been included for this expansion. In the interest of customer safety, HP has notified customers who have registered products that may have been sold with an affected battery. The validation process may show that your battery is not affected by this recall. I used the utility to check my battery before, can I use it again to recheck my battery? I used the utility to check my battery before, can I use it again to recheck my battery? Is HP recalling its notebook computers? Is HP recalling its notebook computers? No. HP is not recalling its notebook computers. HP has announced, in cooperation with various government regulatory agencies, a worldwide voluntary safety recall and replacement program for certain notebook computer batteries. Why is HP recalling notebook batteries? Why is HP recalling notebook batteries? HP has announced, in cooperation with various government regulatory agencies, a worldwide voluntary safety recall and replacement program for certain notebook computer batteries. The affected batteries have the potential to overheat, posing a fire and burn hazard to customers. HP’s primary concern is for the safety of our customers. HP strongly encourages customers to cease use of affected batteries immediately, because these batteries pose a fire and burn hazard. HP will provide a replacement battery for each verified, affected battery, at no cost to you. Customers may continue to use the notebook without the battery installed by connecting the notebook to external power. Which notebooks are affected by the battery replacement program? Which notebooks are affected by the battery replacement program? How do I find out whether my notebook computer battery is affected? How do I find out whether my notebook computer battery is affected? Individual customers should go to the HP Battery Recall website at: HP.com/go/batteryprogram2016 to check if their battery is affected, and to order a free replacement battery, if eligible. HP has put in place a Bulk Validation and Replacement Order process to assist our customers who have 10 or more potentially affected batteries to validate. Is there any way to determine if a battery is affected without going through the validation process on this website? Is there any way to determine if a battery is affected without going through the validation process on this website? Individual customers should go to the HP Battery Recall website at: HP.com/go/batteryprogram2016 to check if their battery is affected, and to order a free replacement battery, if eligible. For customers with 10 or more potentially affected batteries, HP has put in place a process to assist with the validation and ordering process. For details please refer to the FAQs tab on this website. Where do I find the product name and serial number of my HP notebook? Where do I find the product name and serial number of my HP notebook? 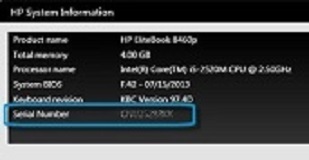 You can download the HP Battery Program Validation Utility from this website. Please go the Validate tab and download the utility. Alternatively you can find this information on the service label on the bottom of your notebook, inside the battery compartment or under the service door; in System Information (press fn+esc on your notebook keyboard); or from the Command Prompt. For detailed instructions please go to the Validate tab on this website. You may also refer to the video here: http://support.hp.com/us-en/document/c00033108. Can I use my HP Notebook without the battery? Can I use my HP Notebook without the battery? Yes. You may continue to use your notebook without the battery installed by connecting the notebook to external power. However, HP strongly encourages customers to go to the HP Battery Recall website at: HP.com/go/batteryprogram2016 to check if their battery is affected, and to order a free replacement battery, if eligible. How do I order my replacement battery? How do I order my replacement battery? If you are eligible for a free replacement battery, you can order your battery through the HP Battery Recall website at: HP.com/go/batteryprogram2016. HP has put in place a Bulk Validation and Replacement Order process to assist our customers who have 10 or more potentially affected batteries to validate. Do I need to return my recalled battery before I can receive a replacement battery? Do I need to return my recalled battery before I can receive a replacement battery? No. HP will send you a free replacement battery for each verified, affected battery validated on the HP Battery Recall website. Refer to the instructions included with the new battery for information on what to do with the recalled battery. I am responsible for numerous potentially affected products, do I have to validate each one individually? I am responsible for numerous potentially affected products, do I have to validate each one individually? HP has put in place a Bulk Validation and Replacement Order process to assist our customers who have 10 or more potentially affected batteries to validate. If my battery has been identified as eligible for replacement, and I have had no issues with it, could the battery have caused any damage to my notebook? If my battery has been identified as eligible for replacement, and I have had no issues with it, could the battery have caused any damage to my notebook? No. The issue identified is with the battery only and would not cause damage to the notebook. You may continue to use your notebook without the battery installed. HP will provide a replacement battery for each verified, affected battery, at no cost to you. Is it safe to buy HP Notebooks and notebook batteries? Is it safe to buy HP Notebooks and notebook batteries? Absolutely. HP fully stands behind its products. HP has taken a proactive approach to this situation to ensure the safety of our customers and the integrity and quality of our products. I bought a replacement battery for one of the HP Notebooks that is affected by the replacement program. Could the replacement battery also be affected? I bought a replacement battery for one of the HP Notebooks that is affected by the replacement program. Could the replacement battery also be affected? HP recommends that you go to the HP Battery Recall website at: HP.com/go/batteryprogram2016 to check if the battery you purchased is affected. I have more than one of the affected batteries. Will HP replace all of my recalled batteries? I have more than one of the affected batteries. Will HP replace all of my recalled batteries? Yes. HP will provide a replacement battery for each verified, affected battery, at no cost to you. HP has put in place a Bulk Validation and Replacement Order process to assist our customers who have 10 or more potentially affected batteries to validate. Can I continue to use my notebook battery even if it is affected? Can I continue to use my notebook battery even if it is affected? No. HP strongly encourages all customers to cease use of the affected batteries immediately, because these batteries pose a potential safety hazard to customers. How long will it be before I receive my free replacement battery? How long will it be before I receive my free replacement battery? On placing your order you will receive an Order Confirmation email. Once your battery has been shipped, you will receive a Shipment Confirmation email. Please refer to your Shipment Confirmation email with tracking number to track the progress of your shipment. You may also check the status of your order on the Check Order Status tab on this web page. Will HP provide a container to send back the recalled battery? Will HP provide a container to send back the recalled battery? Please refer to the instructions included with the new battery for information on what to do with the recalled battery. Will I need to replace my notebook computer? Will I need to replace my notebook computer? No. The issue identified is with certain batteries for specific HP Notebook Computer models only. Please validate the battery manually on the HP Battery Recall website at: http://www.HP.com/go/batteryprogram2016. When requesting a replacement battery I received a message that this battery number has already been replaced. When requesting a replacement battery I received a message that this battery number has already been replaced. Please go to Contact Us section on the HP Battery Recall website at: http://www.HP.com/go/batteryprogram2016 and complete the form to request assistance. I clicked on “Download Utility” and nothing happened. I clicked on “Download Utility” and nothing happened. The utility is a small download. You will need to open and run the downloaded utility by clicking on the *.exe file. The validation results show in a window. If you are having problems with the utility, please validate your battery manually on the HP Battery Recall website at: HP.com/go/batteryprogram2016. Is it safe to handle an affected battery outside of the notebook? Is it safe to handle an affected battery outside of the notebook? Yes. HP's primary concern is the safety of our customers. To minimize risk of the battery overheating, HP advises customers to cease using the battery immediately. Remove the affected battery from the notebook and order a replacement battery on the HHP Battery Recall website at: HP.com/go/batteryprogram2016. Please refer to the instructions included with the replacement battery for information on what to do with the recalled battery. What should I do if I have a battery that shows signs of overheating? What should I do if I have a battery that shows signs of overheating? If your battery shows signs of overheating, stop using the battery immediately. If your battery is not one of the recalled batteries, contact HP at the in-country telephone numbers at the following link: https://hp.com/go/Recallcontacthp. If your battery has been identified as affected by this recall, you can order a replacement battery at no cost, through the HP Battery Recall website at: HP.com/go/batteryprogram2016. Can I take my recalled battery to an HP service partner and exchange it for a new battery? Can I take my recalled battery to an HP service partner and exchange it for a new battery? No. The HP Notebook Battery Safety Recall and Replacement Program is being conducted through the HP Battery Recall website at: HP.com/go/batteryprogram2016. I’ve never had any problems with my battery. Should I have it replaced? I’ve never had any problems with my battery. Should I have it replaced? HP strongly encourages all customers to cease use of affected batteries immediately, because these batteries pose a fire and burn hazard. In the interest of safety please go to the HP Battery Recall website at: HP.com/go/batteryprogram2016 to check if your battery is affected, and order a replacement battery if eligible. Your order number can be found in the confirmation email sent to the account registered during order placement. Calls for safety recall program support only. For assistance, please complete the form below and click 'Submit '. Please enter your request below. Please provide your order number if available.